The EPA discovers chemicals related to fracking in a Wyoming aquifer. A ProPublica report reveals that the EPA found chemical compounds associated with fracking in the aquifer below Pavillion, Wyoming, an area that "has been drilled extensively for natural gas over the last two decades and is home to hundreds of gas wells." Apparently residents have been long complaining about their water -- the EPA tested their tap water, found chemical contamination, and drilled monitoring wells into the aquifer to "get a more precise picture of the extent of the contamination." 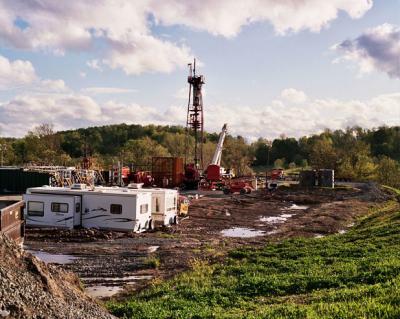 ...the chemical compounds the EPA detected are consistent with those produced from drilling processes, including one -- a solvent called 2-Butoxyethanol (2-BE) -- widely used in the process of hydraulic fracturing. The agency said it had not found contaminants such as nitrates and fertilizers that would have signaled that agricultural activities were to blame. Here's what you should take away from this report: Fracking is a danger to the water supply wherever it occurs. Anyone who tells you otherwise is a f*cking liar.